I’m very excited for this as a Pro and VR owner. Early adopter! Simulation on a 2d screen versus 3d vr screen(s), vr hands a better simulation feeling then any other 2d oled 55 inch screen any day…..now taking a picture of my car in gt sport would look way better on my tv, but when your racing or just driven around vr explores the simulation driving experience in a real feeling world not able to be found on a 2d screen, and the ps4 pro is a must if your a psvr owner every game that I’ve played in vr plays way better on pro. Also a PSVR early adopter so far I love it and the fact that now Resident Evil is getting really good really previews for VR as well is also nice to hear. Bought my PRO yesterday and I am eager to see how much better the power the PRO offers helps with VR haven’t had a chance to use it with VR just yet but tonight I finally have time to try. This game is going to be amazing I hope we get some new footage in the coming months. I wanted to ask if you guys could do several cool Dynamic Themes with full movement, night and day cycle and beautiful music? That would be amazing. Also please look at doing a ton of Avatar pictures and Sharefactory special suite of GT Sport content. Oh, and of course support for Little Big Planet 3. Some nice ideas there – I imagine all the relevant teams will be pretty much stacked with so much going on right now, but if anything pops up we’ll be sure to let you know. Doesn’t sound like the VR is being used the most.. This game is a flagship of Sony and should have FULL VR support. If I can’t do a race with other cars in VR then this is no buy. Sorry but others shouldn’t either, lots of games I was looking for VR are now silent or have decided limited use. Feel like I been punched in the gut, very close to selling my PSVR. Sell that then your ps4 and let us all get on enjoying it. As a general rule, any console accessory that is sold separately would only get limited support in games. Also, the more costly the accessory is, the fewer people would buy it, and the support would be even less. PS VR needed to be priced absolutely right to have any chance of success. That train has passed. I wish best for PS VR, but I doubt that we would be seeing great sales numbers beyond the launch period. I am also expecting limited support at this time. Best case scenario would be that PS5 launches with full PS-VR2 support for all games. That would be the ideal time to buy an expensive accessory with guaranteed support. Or just wait for the inevitable big discounts next year for the current version. will you quit replying to others and spreading misinformation, there are those who tried this game in PSVR already. You guys obviously can’t read.. I said racing OTHER RACERS in VR isn’t supported and hasn’t been shown. RACES are not in and VR isn’t full supported. Good grief internets are where stupid people reside. Yep starting to get disappointed more and more, first Project Cars dropping PSVR all together and now GT Sport slowly letting us lower our expectations more and more. Resident Evil is getting really good early preview in VR so far and that’s the game I feel will be the first fully supported AAA game to show what the PSVR can do and now that PRO is available to enhance the resolution and graphics is exciting I think. It’s still very early in for PSVR and we don’t know if the PSVR and Gran Turismo will be limited yet. Especially if you have a Pro. First half of 2017 ? I hope you are not serious. Given PD’s atrocious record of delays, I would not expect this until 2018 (at the earliest). Ummmm no, the first thing people ask is”why do all the cars sound like vacuum cleaners?”. Graphics has never been a problem for GT, I’m really hoping they step it up in the sound department this time around. Ken30NYC its right, i have all GT and I have platinum all GT for ps3 and i can confirm that almost all cars always sound the same, even when you upgrade with a new turbo kit and intercooler for a non stock turbo car and sound like any other cars in the game, or like people said a vacuum cleaner, if GT can match the sounds of the cars of Driveclub that will be extremely awesome!!! Get games like Rigs, Eagle Flight, and EVE Valkyrie. They all have single player campaigns that last for several hours as well as multiplayer for tons of replay value. PSVR makes the game deserved more attention, can’t wait to play the game with vr. Very excited and love that there will be PS VR support. I just wish that it would support 3D. That was such a great addition on PS3. Can’t wait!!!!! Need this game asap!!!!! When will it be released i preordered the game 4/5 months ago thinking i was going be getting it end of the year now there is no scheduled time. Why does it take them years to create a game that forza can bring out 2 in that time. 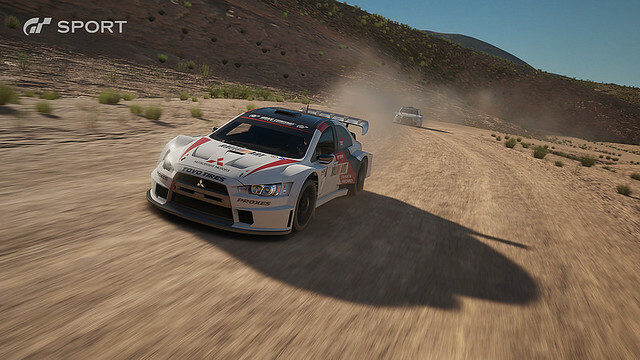 Ps4 players are screaming to get a good racing game. Forza is an arcade racer GT is a driving simulator. I think forza has come on leaps and bounds but yearly updates are always a mistake. 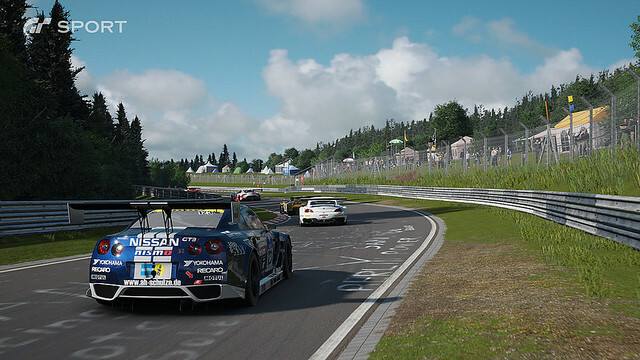 When gt sport drops it will again set the bar for others to follow. GT 6 is still an awesome game and still looks nicer than the latest forza on last gen hardware. Orbilator…..I can’t tell if you are join or are just naive. Forza Motorsport is not an arcade racer it is a racing simulator and has been a better simulator then GT since its introduction. Forza is not visually as pretty as GT but saying the newest Forza isn’t as pretty as the last GT is ludicrous. Sometimes I just don’t understand fan boys and I wish it would stop. It is just old to hear this, if you don’t like Forza fine but don’t just make stuff up, it’s not cool. BTW before you start about how I am a troll. I own every system so I am not a fanboy, I am a true gamer who can afford every system and play every single game that releases if I choose to. That being said I own both GT and Forza games. I still prefer Forza games over GT. They have had damage simulation since day one GT6 still doesn’t have damage and you call that a true simulator. Hello! Is there any info about improvements in the game when using FullHD display? They’d better do something to improve this game cause what was shown was just terrible. That’s a great reason to buy a PSVR and PS Pro. What on Earth is “an 18 GB VPS uncompressed stream”? I really don’t understand the decision that was made to make GT6 for PS3 not long after the release of GT5 when PS4 was on the horizon. It doesn’t make any sense. GT6 should’ve been a PS4 game. It’s not like Polyphony wasn’t aware of PS4’s launch. Now here we are going on 4 years into the PS4’s life cycle and still no Gran Turismo this gen. Way to go Sony. Judging by Yamauchi’s suspicious VR comments, it doesn’t sound like the game will be fully playable in VR. For anyone excited about the prospect, I encourage you to moderate your excitement. VR on DriveClub has proven to be a nauseating experience for many users. Unless PD has some kind of magic bullet, Yamauchi could be dancing around the fact that the game played in VR could be a poor experience, and VR may be relegated to virtual car shows and test laps. There are going to be a lot of disappointed people when this game is released. It doesn’t sound like the main gameplay will be VR. Likely, there will be a VR experience tacked on that isnt part of the main game. Also, notice his careful wording “targeted 60 frames per second”. I just hope that the marketing is open and honest when the time comes. Please have a good ps4 pro 1080p mode – extra detail/draw distance at 60 fps! “gets of the starting grid”. Yeah right. Won’t be holding my breath for that one. I am very interested in getting a sim racer in VR and whilst Project Cars suggested compatibility, it failed, Assetto Corsa developers have said, unlikely and DriveClub is a great experience (yes, people slam it for poor visual fidelity, but it’s got fantastic immersion and for me did not have any nausea issue) it is very much an arcade racer. GT was for me going to be a potential system seller but it would seem that Caz has decided to make use of a VR featurette rather than the full blooded VR experience which is a real shame. I think perhaps the visuals have to be reduced far too much for his liking and reduced it down to a single car on track experience. Please, someone develop a sim racer for VR, there is so much potential there!! I guess we need to remind ourselves that this kit has only just been released. My recommended VR games are Rigs, Eve, DriveClub and Headmaster. VR GT sounds awesome, but I hope to be better than DriveClub VR. Did Kaz say 60 FPS, as in frames per second, at 4K!? Who am I to doubt him, but while your dropping these gems of HD awesomeness how about hooking up 60@1080 for the original PS4 Vanilla adopters? If I don’t see that first, then I will have a hard time buying a PRO for 60@4K. Just saying.